If you are looking for a custom branded blank CD-R or DVD-R that you can use in-house to store files, presentations or distribute marketing materials then we can provide custom printed blank media. Your presentation deserves more than a label or Sharpie, represent your brand with professionally printed discs. 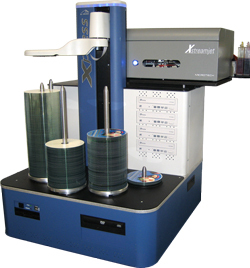 Custom printed CD-R and DVD-R will provide a unique branded disc that you can use for duplication in a tower or simply a single disc at time from a computer burner. Full-color inkjet and standard black text printing for blank CD-R or DVD-R using hih-quality Talon Printer production line. Pricing below includes a 52x CD-R or 16x DVD-R. Consistent high quality printing is assured by using technologically advanced automated systems. Automated media printing also insures that the printing quality will be consistent, and meet the quality expectations of the customer. Printing direct-to-disc with automated equipment eliminates potential field problems caused by improper centering of paper labels. 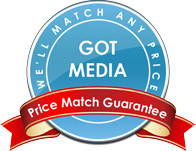 Additionally, our automation allows GotMedia to accurately know our production rates and capabilities – enabling us to meet the timely delivery commitments.